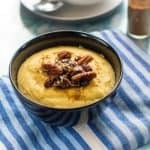 Jamaican cornmeal porridge – a delicious vegan twist on one of the most popular porridge recipes from the reggae island of Jamaica also known as cog or pap. I have another Caribbean recipe to share with you guys and this on is called Jamaican cornmeal porridge. I’m really pleased with how this naturally gluten free cornmeal breakfast recipe turned out. It took me some weeks to complete my own rendition of cornmeal porridge. To the point where I now have some of my family drinking this vegan version instead of the conventional one. What is Jamaican cornmeal porridge? 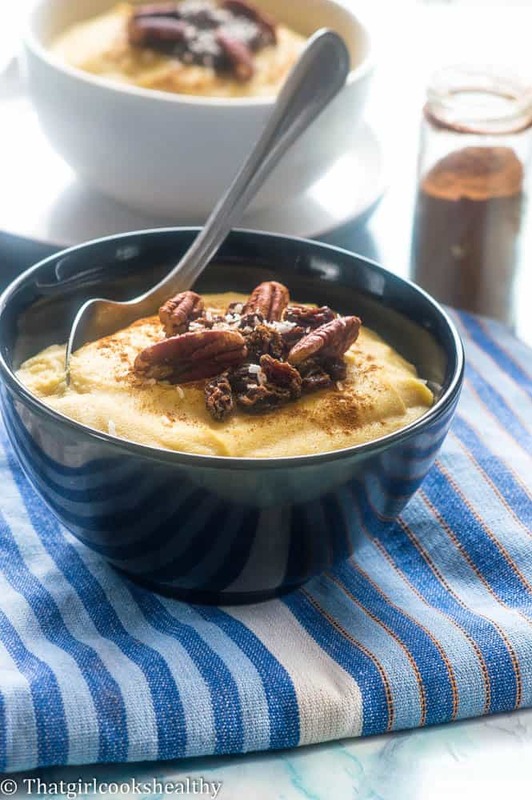 Jamaican cornmeal porridge (aka cog or pap) is a dietary staple for Jamaicans and many Caribbean islands. The porridge is made from cornmeal (polenta), milk, cinnamon, nutmeg, vanilla, water and condensed milk to serve as a sweetener. It’s delicious, creamy, warming and very very filling. What is the thickness of cornmeal porridge? Cornmeal porridge is somewhere in the middle in terms of texture. It certainly shouldn’t be too thin/watery nor should it be so thick that you can literally cut it with a knife. It all depends on how much cornmeal is used to make the porridge. For example if you’re making a recipe that calls for 1/2 of cup of cornmeal, you’ll want to make that you have three times the amount of liquid (3 cups approx) to compensate for the expansion of the porridge as it boils. Also as the porridge cools it tends to get thicker too. It’s so much easier to control and correct porridge that is too thick (as you can add more liquid) than it is to rectify porridge that is too thin because for the increase in lumpiness from the addition of cornmeal. 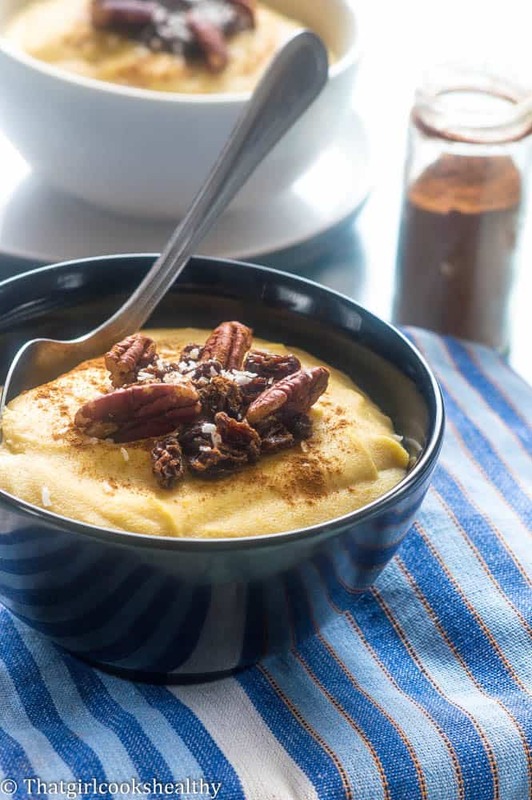 The conventional version of cornmeal porridge is not dairy free or vegan friendly. One thing I’ve learnt during my cornmeal crusade is the importance of condensed milk, especially for the vegan style. My previous attempts were made with solely coconut milk and coconut palm sugar. Granted the results were okay, but underwhelming which left me disheartened. There was an edge and the sweet creamy taste that was missing. Thankfully I was able to identify the missing piece to the puzzle – condensed milk and rescue my recipe. Finding the perfect vegan version wasn’t easy since a lot of recipes online call for a canned version containing additives and preservatives. Homemade milk wasn’t an option since it lacked the true fat content. Just when I was about to give up I brought some organic coconut milk to make my vegan condensed milk and voila – Cornmeal porridge vegan style was birthed. Where can I buy organic/non GMO cornmeal porridge? Since corn/cornmeal is on the GMO hit list it makes consumption quite controversial. The good news is there are organic and non-gmo versions which can be easily purchased mainly online from Amazon. organic and non GMO cornmeal is expensive but I try my best to buy this when possible. However, if you’re primary concerns are only to veganise the recipe then this section doesn’t apply and you can buy your cornmeal from most local supermarkets. There are different textures of cornmeal widely available ranging from super fine to course. I personally like the super fine texture because the porridge comes out creamy and smooth. 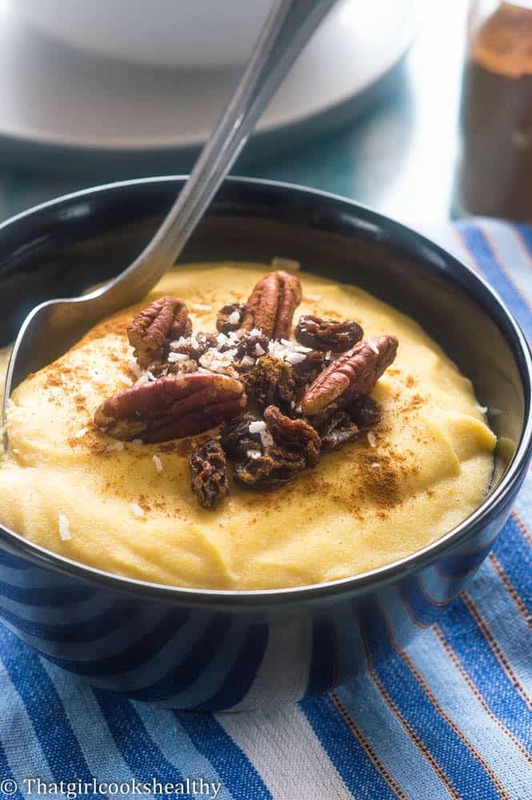 What are the health benefits of vegan cornmeal porridge? Do I have to use coconut milk to make the recipe? In short the answer is no. I know many people aren’t fans of coconut milk so an alternative plant based milk can be used to achieve the same results. Also, a few people want to know how to make cornmeal porridge without milk. This can be done by using leaving out the use of milk and using water only. By doing this will alter the taste drastically though. Mix the cornmeal mixture as you’re adding it to the saucepan to avoid lumps. Use the superfine cornmeal for a creamy/smooth texture. Allow the cornmeal to cook for at least 15 minutes to yield optimal taste (the long the better). Use low fat or fat free plant based milk if you’re seeking a low fat option. Mix the cornmeal with water and set aside. Pour the 3 cups of coconut milk into a sauce pan and simmer for 2-3 minutes on medium heat. Once the milk starts to boil, add the cornmeal mixture to the pot. Do this slowly and make sure to turn consistency to omit lumps – continue to stir until all the watery cornmeal has gone. At this point this is where the remainder of recipe requires plenty of stirring, so get that arm in motion while adding the outstanding spices and condensed milk. Continue to stir for 15 minutes until the porridge is smooth and creamy. Ensure to stir cornmeal in the initial stages and throughout to omit lumps forming. Cornmeal is sometimes sold as polenta or maize meal. This sounds so comforting. Loving the Jamaican recipes! Aww thanks Dannii. I hope you get to sample some on your trip to Jamaica. This looks like what I grew up eating for breakfast but yours is more flavorful with the addition of coconut milk. Can’t wait to try this as it gets colder. I’m not surprised since Caribbean food is influenced by its African roots. I used to live with someone from Ghana who’s wife used to make him something similar. It was so delicious and now I finally have a recipe to try! Hi Amanda, Yes this recipe definitely traces back to West Africa. I hope you do manage to sample a taste of the Caribbean. Which specific brand cornmeal did you use? Hi Chin, I’m not sure where you are located but King Arthur flour do a great non GMO organic cornmeal. I haven’t noticed the King Arthur brand locally, but I can order the Organic Yellow Cornmeal #4753 from kingarthurflour.com. Yes, unfortunately it’s not so easy to source but that’s the best quality one I have found thus far. Actually I need to write a post about where my readers can purchase some of the ingredients that I use. The local food co-op now has the Arrowhead Mills Organic Yellow Cornmeal, which turned out well. BTW, Can you update the ingredients list to indicate whether “tsp” means teaspoon or tablespoon? Hi Chin, glad you enjoyed the recipe and most importantly have access to organic cornmeal. Yes I will amend the ingredients list tsp means teaspoon btw. Charla, Thanks for the time and labor you took to making this treasured comfort food more healthy. 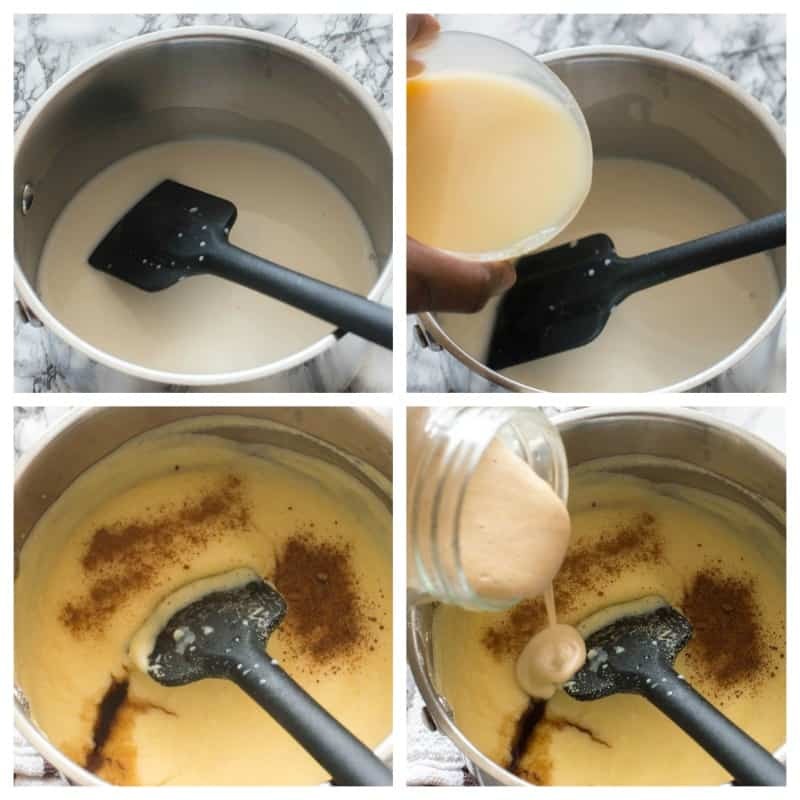 Curious … do you know if your homemade condensed milk works well in other Jamaican porridge recipes (e.g. hominy, banana, plantain, peanut, etc? 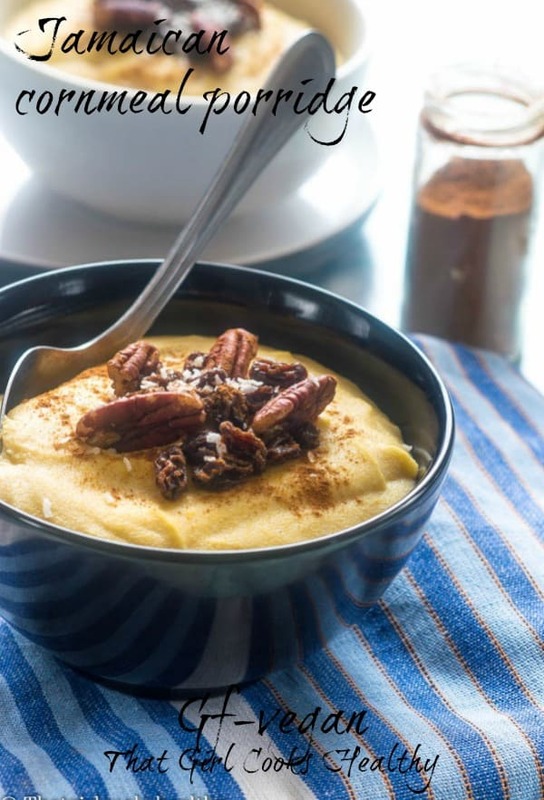 I am so glad that I Came across your blog with this vegan Jamaican cornmeal porridge. Loved your details and the porridge itself! This sounds so delicious and I can’t believe I’ve never had it before! Thank you for all of your hard work in adapting this recipe. Great job! Thanks for commenting and you are welcome Demeter. Delicious comfort food! I love this recipe. I think I would also like a little cardamom mixed it. YUM! Thanks Susie. I’m a huge cardamom fan so will definitely try adding it next time. I’ve had lots of porridge recipes but never Jamaican cornmeal. This looks thick and creamy and delicious. A great way to stay full until lunch. This looks and sounds so interesting!! Love the flavors you have going on in that pot! Can’t wait to give it a try this weekend!